Divaali is a festival of joy, splendor, brightness and happiness. It is the festival of lights and is celebrated with great enthusiasm by all Indians all over the world. The uniqueness of this festival is its harmony of five varied philosophies, with each day to a special thought or ideal. People celebrate each of its five days of festivities with true understanding, it will uplift and enrich the lives. The first day of Divaali is called Dhanvantari Triodasi or Dhanwantari Triodasi also called Dhan Theras. It is in fact the thirteenth lunar day of Krishna Paksh, the dark fortnight of the month of Kartik. On this day, Lord Dhanwantari came out of the ocean with Ayurvedic for mankind. This day marks the beginning of Deepawali celebrations. On this day at sunset, Hindus should bathe and offer a lighted deeya with Prasad (sweets offered at worship time) to Yama Raj, the Lord of Death and pray for protection from untimely death. This offering should be made near a Tulsi tree, the Holy Basil or any other sacred tree that one might have in their yard. The lighted deeya can also be placed outside of the door. The second day of Divaali is called Narak Chaturdasi. On this day Lord Krishna destroyed the demon Narakasur and made the world free from fear. On this day, one should massage the body with oil to relieve it of tiredness, bathe and rest so that Divaali can be celebrated with vigor and devotion. On this night, Yama Deeya should not be lit. The Shastras (Laws of Dharma) declares that Yama Deeya should be offered on Triodasi night with Prasadam. Some people mistook it to mean that because Yama Deeya was lit on that night, that it should always be lit on the night before Divaali. This is absolutely not true. It is advisable that one consults with a learned Pandit or Hindu Astrologer for proper guidance on this matter. This is the day when worship unto Mother Lakshmi is performed. 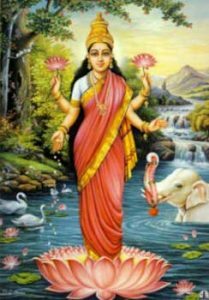 Hindus cleanse themselves and join with their families and their Pandit (priest) and they worship the divine Goddess Lakshmi to achieve the blessings of wealth and prosperity, the triumph of good over evil and light over darkness. On this day, Govardhan Pooja is performed. Many thousands of years ago, Lord Krishna caused the people of Vraja to perform Govardhan Pooja. From then on, every year Hindus worship Govardhan to honor that first Pooja done by the people of Vraja. The fifth day of the Divaali is called Bhratri Dooj. This is the day after Govardhan Pooja is performed and normally two days after Divaali day. It is a day dedicated to sisters. Many moons ago, in the Vedic era, Yama (Yamraj, the Lord of death) visited his sister Yamuna on this day. He gave his sister a Vardhan (a boon) that whosoever visits her on this day shall be liberated from all sins. They will achieve Moksha or final emancipation. From then on, brothers visit their sisters on this day to enquire of their welfare.